Home / cakes / LIFE IS SWEET!!! Love, Love, Love this new shirt from Cents of Style. LIFE IS SWEET!!! What a great reminder!! Being a mom, working, taking care of the house, laundry, feeding everyone, getting kids to school and extra activities, is busy and crazy!! Life can be hard and sometimes overwhelming. I like the simple message of this shirt. It reminded me to appreciate how great life really is! This shirt is so soft and I love that I can wear it so many ways! Everyone knows that I love sweets too, so this shirt is a double duty winner for me!! I love cakes and sweet treats. 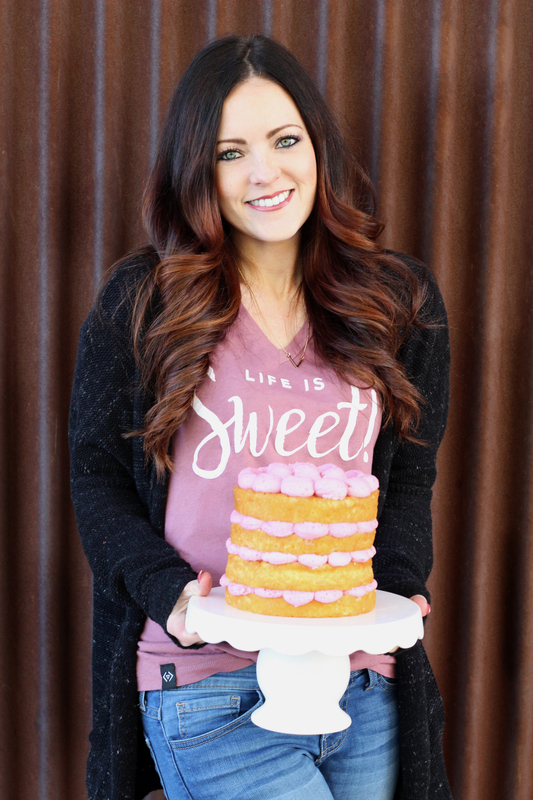 When I saw this shirt, I was inspired to make something sweet and yummy for my family to enjoy! 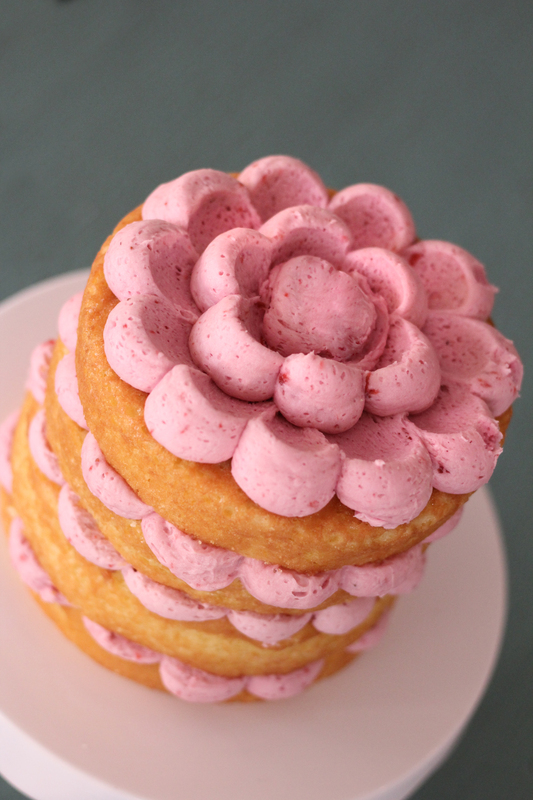 The color reminded me of berries, so I made this cute little cake with strawberry buttercream. 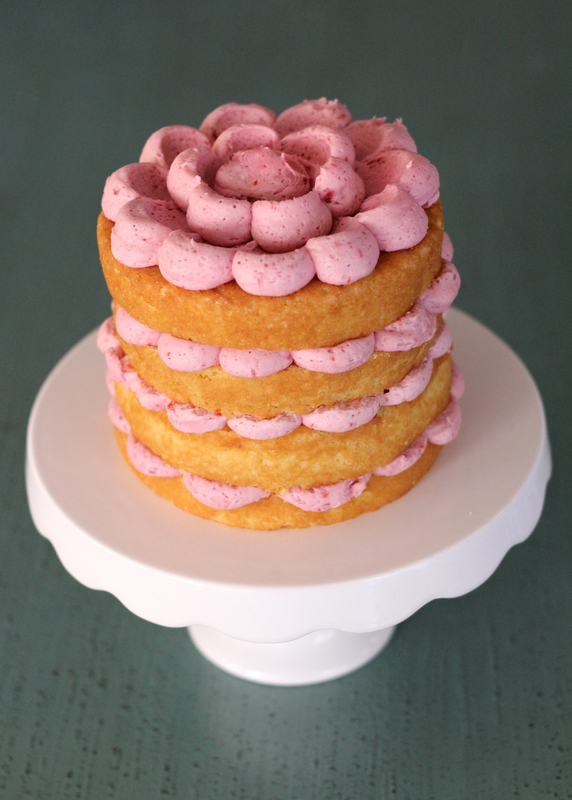 This cute naked cake has a fun element with the dots of frosting! super simple to make, but makes a big impression!! All you have to do is slice your 2- 6″ cakes in half horizontally. Fill an icing bag with frosting after you have inserted your large tip, I used this one —> Wilton 1A tip . Pipe dots around the edge of the cake and then fill in the center solid. Place the next layer of cake on top of that and press down softly that will make it bulge out a little. Repeat 2 more times with the other layers and then on the top pipe the dots again around the outside. Using THIS tool, press down in the center of the dot and slide toward the middle of cake. Continue to all dots. Pipe more dots in center and repeat to make more petals and then fill the center solid. How “SWEET” is that?!! Get yourself one of these darling and inspiring shirts from Cents of Style today for 50% off using the code INSPIRE17 at checkout. Coupon code will be valid 1/20 through 1/22. CLICK —> HERE to get there directly!